Today’s post was originally published on February 22, 2008. It was substantially revised and re-posted on March 30, 2015. It’s a culture-spanning O name that feels both current and classic. 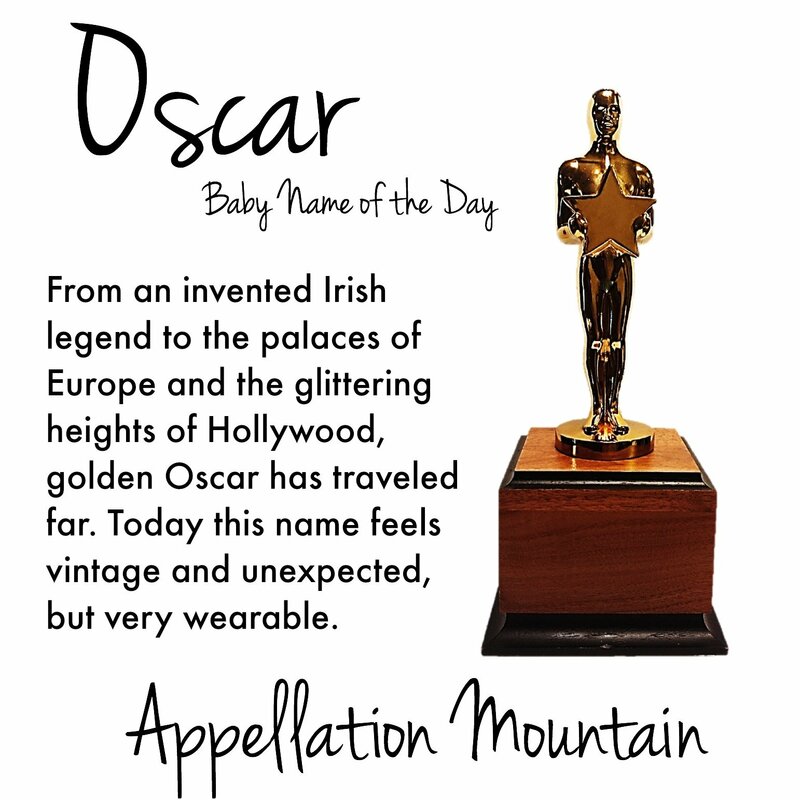 Our Baby Name of the Day is Oscar. In myth, Oscar is the son of the fairy Niamh and the warrior-poet Oisin. This makes him the grandson of Finn MacCool. He’s a warrior, and a noble figure, too. It means “deer friend,” from the Gaelic elements os – deer – and cara – love. It’s from an Old English or Norse name, Osgar or Asgar, meaning god and spear. The legendary figure was popularized by eighteenth century Scottish poet James Macpherson. He claimed to have translated a series of epic poems written by a third century Gaelic poet, Ossian. Macpherson most likely wrote every syllable himself. Oscar appears in these works, and the works were widely read. Napoleon himself was a huge fan. In the middle of the 1800s, the Swedish royal family had run out of male heirs. French-born Jean-Baptiste Bernadotte, a capable military commander under Napoleon, became King Charles XIV John of Sweden. The king’s Paris-born son, Joseph François Oscar Bernadotte, became King Oscar I of Sweden in 1844 – from a work of historical fiction to the throne, in less than a century. Literary giant Oscar Wilde was also named for the character. By the late nineteenth century, Oscar was well-established as a given name in the US. It remained in the Top 100 through 1925. By the 1960s, Oscar had fallen into the 200s. Neil Simon’s 1965 play gave us roommates Oscar and Felix. They were plausible names for men at the time. ABC created a beloved television series from the play in 1970. By the time the show ended its run in 1975, this was less true. Sesame Street debuted in 1969. Five years later, when the show was solidly established, Oscar stood at #190 – a increase in use. German immigrant Oscar Mayer founded his empire of processed meat back in late nineteenth century Chicago. In 1974, the first commercial declaring, “My balogna has a first name, it’s O-S-C-A-R,” debuted in the US. In recent decades, Oscar has gone from pan-European possibility to Latino favorite. Why? The name was already rising when Mexican-American boxer Oscar De La Hoya won gold at Barcelona in 1992, but De La Hoya must have helped. There’s also Oskar Schindler, of Schindler’s List. The 1993 movie won the Academy Award for Best Picture. And that brings us to another notable use of the name. The Academy Awards were first presented back in 1929. The award itself is a golden statuette. There’s much debate about how the award got it’s name. Some credit Bette Davis. Walt Disney referred to the award as Oscar as early as 1932. Others credit a gossip columnist or a long-time employee of the Academy. What’s certain is that the name was formally adopted in 1939, and has been synonymous with the awards ever since. Oscar has fallen slightly, to #178 in 2013. And yet, there are lots of reasons to think this name would wear well. It has that vintage, ready-for-revival vibe. The ‘r’ ending is quite stylish. And Oscar strikes the right note for parents after a stands-out/fits-in name. If you’re after a choice with a rich story and an on-trend sound that isn’t leaping up the popularity charts, Oscar is one to consider. I suspect Archbishop Oscar Romero has something to do with the rise in popularity among Latinos, and I expect it to rise more soon among Catholics in general, if it hasn’t already, as it’s said Pope Francis will “almost certainly” beatify him this year, and perhaps even skip directly to canonization. I’m trying to like it — but The Grouch is my biggest obstacle! Intellectually I *get* that this is an awesome name! Love Oscar! It was a middle name for my Swedish-born great-grandfather and his son, my great-uncle. I’m deep in to the Swedish line on my family tree and loving nearly all the names. Lots of relatively unusual choices- Axels, Nillas, Britas. Axel and Oscar are both near the top of my list for if we ever have a boy. 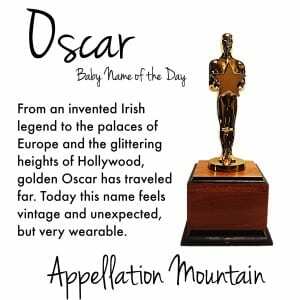 My husband and I name our son (born October 2013) “Oscar Arthur” — Oscar after my grandfather (Swedish-American) and Arthur because it’s a paternal-line middle-name tradition. I have always associated it with Sweden, but I discovered it’s Irish roots when considering it as a name for our son. Love the mythology! We named our son Oskar with a “k” to honor my German ancestry. My mom’s middle name is Walburger and our family is still in contact with members of the family in Germany, including great-Uncle Oskar. I wanted a German name, but thought most of them sounded too harsh or too foreign, but Oskar was perfect! And so is my redheaded, Danish looking son! Hi Abby, 7 days left….can you restore all of Oscar please? Original post, February 2008. Thank you! Thanks so much, Allison! You’re probably right about Oscar, but with fashionable parents choosing Henry, I suspect it’s a one-two punch! Gabriel was 28th in 2006 – quite popular – but Enzo lagged at #737. Irish? Who knew! The only Oscar I have ever known is middle aged and Puerto Rican. I’ll wager the name’s popularity is on the rising along with the Hispanic population in this country. I wonder how Gabriel and Enzo are faring. My husband balked at every name I suggested but had almost no contributions whatsoever. Then again, after he put “Madison” on the table I did stop asking him entirely. Love your blog, can’t wait to hear your name choices! What a great name to find hanging on the family tree! I’ll admit I was surprised to discover Oscar’s Celtic roots. I suspect we’d also find a bunch of Oscars on the Upper West Side and other exclusive, fashion-forward enclaves. I’ll have to ask around. It’s funny, most of the young Oscars I know are Hispanic, and they’re usually named after Oscar de la Hoya. I never thought of it as a Hispanic name, but my fiance does. […] Elida, Galilea, and Giselle, plus a few first-middle combos: Sofia Sabrina, William Lisandro, Oscar Alexi, Michael Courtney, Celestin Georgia, Norma Elisabat, and Maya Antoinette. […] to hear the name and think of anyone else. […] News: Welcome Felix! 22Oct08 Gillian Anderson, mom to Piper and Oscar, has welcomed her third child – a son called Felix! […] the similar Oscar, this one can be viewed as either a stylish literary moniker or a Hispanic heritage choice.